Food is an important part of the conference experience, and Indian hospitality derives a lot from its varied cuisine. INTERACT 2017 will provide lunch on all five days and we have narrowed down the menus based on lot of careful food tasting 'research' :). We have planned the following menu for the conference lunches and tea sessions. If you have any specific dietary restrictions, please let us know on food[at]interact2017.org and we will order special things for you. We have also made a list of restaurants around the venue. Check it out here. Diwali is the five-day festival of lights, celebrated by millions of Hindus, Sikhs and Jains across the world. The festival, which coincides with the Hindu New Year,celebrates new beginnings and the triumph of good over evil and light over darkness. On Diwali night, people dress up in new clothes, light up diyas (lamps and candles) inside and outside their home to help Lakshmi, the goddess of wealth, fertility and prosperity, to find her way into people's homes. Matar Karanji- Matar Karanji is an indulgent Maharashtrian snack made using seasonal fresh green peas in winter. It is usually served as a tea time snack. Murg Bagmati- Murg (chicken) with touch of spring onions, palak and coriander leaves in mild spices. Gobi Matar Masala- As a flavorful vegetarian side or meatless main course, this vegan and gluten free Indian Curry Cabbage keeps lunch healthy and delicious! Shahi Bhindi- As name suggests a bhindi cooked in rich and creamy cashew nut gravy that has a royal taste to it. Tomato Pudina Biryani- Mint, some coriander leaves and many whole spices makes up the spicy flavoured green colored rice. Puri- Poori or deep fried Indian Bread is very famous in India. It makes an awesome combination with sweet Shrikhand, Veggies and Chicken with Gobi matar masala or chicken items. Chapati- Delicious Indian flatbread. Tastes good with Indian curry and main dishes. Shrikhand- A thick creamy and delicious sweet dessert made using curd known as Chakka. Moong ladoo- Another must have Diwali snack. Mung dal ladoo is a ball shaped sweet dish made of green gram without skin (mung dal), sugar and ghee. Holi is a Hindu spring festival celebrated in India and Nepal, also known as the "festival of colours". The festival signifies the victory of good over evil, the arrival of spring, end togetherness. Holi celebrations start on the night before Holi where people gather, perform religious rituals in front of the bonfire, and pray that their internal evil be destroyed in the fire. The next morning is celebrated as Rangwali Holi– a free-for-all festival of colours, where people smear each other with colours and drench each other. Water guns & water-filled balloons are also used to play & colour each other. It signifies unity. Milijuli tarkari- A perfect mixed vegetable to represent togetherness which is a main significance of Holi festival. Navaratna pulao- It is an irresistible assortment of colourful different cooked vegetables and then mixed with the rice and flavorful spices. Basundi- It is a sweetened condensed milk made by boiling milk on low heat until the milk is reduced by half. as a sweet accompaniment to meal but it can be enjoyed anytime you like it. Mathri- While playing Holi, this flaky biscuit from north-west region of India, is a perfect munching snack. It is made from flour, water, and cumin seeds. Kaju katli- It is an extremely popular North Indian sweet, often made during special festive occasions. This lip-smacking dessert recipe has the goodness of cashews. Navratri, meaning 'nine nights', is one of the most popular and widely celebrated Hindu festivals in many parts of India. Gujarat, however, is the only state that erupts into a nine-night dance festival, perhaps the longest in the world. Each night, all over the state, villages and cities alike, people gather in open spaces to celebrate feminine divinity, referred to as Shakti. Sev tamatar- Sev Tamatar or Sev Tamaeta (as we call it in Gujarati) is a simple sabzi made by tempering tomatoes and adding gram flour strands (sev) to it. Boondi Rayta- This savoury side dish is made with beaten curd, boondi (small gram flour balls). Mohanthal- It is made from sweetened gram flour and fudge flavored with saffron and nuts. This is a signature dish from Gujarat state and is prepared in many auspicious occasions like Diwali and Navratri. Khakhra- It is a thin cracker common in the Gujarati cuisines. It is made from mat bean, wheat flour and oil. Chorafali- A street style food – This melt in the mouth traditional Gujarati snack tastes like papad or chips. Its sour and spicy seasoning of chilli powder and dry mango powder makes it one of most irresistible snack. Kothimbir vadi- Kothimbir Vadi is basically savoury fritters made up of Coriander leaves using besan(chickpea flour). Tomato saar- It is a simple and mildly spiced tomato broth made regularly in a Maharashtrian households. Mini batatavada- Like Paris has its Macarons, New York has its Cheesecake, Mumbai has its Batata Vada. It is a scrumptious snack made with balls of mashed potatoes, spices, dipping the balls in a chickpeas flour batter and deep-frying them. Golden and crispy on the outside, divinely delicious on the inside. Ukadiche Modak- The modak is the favourite sweet of the Hindu deity, Ganesha. During Ganesh Chaturthi, The puja always concludes with an offering of 21 Modaks to Ganesha as Prasadam. This Momo like steamed sweet has filling of freshly grated coconut and jaggery while the outer soft shell is made from rice flour. Bakarwadi- Crispy fried dough spirals stuffed with a sweet spicy mixture of coconut, poppy and sesame seeds. Naralwadi- maharashtrian special fudgy coconut squares made from grated coconut and sugar. Lohri marks the beginning of the end of winter, coming of spring and the new year. The festival is traditionally associated with the harvest of the rabi crops. The traditional time to harvest sugarcane crops is January, therefore, Lohri is seen by some to be a harvest festival. And thus, Punjabi farmers see the day after Lohri (Maghi) as the financial New Year. It is known as Makar Sankranti in the other part of India. Punjabi samosa- Signature dish of Punjab is one of the most popular snack in India. 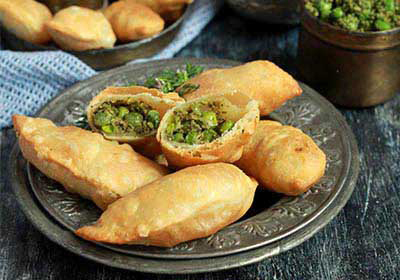 The traditional Punjabi samosa is large, crispy at the ends and its filling is mainly made up of potatoes and peas. Dry Fruit chikki- A delicious traditional candy made from dry fruits and jaggery. They are usually prepared during the harvest festival in northern India. Butter Chicken- The boneless chicken curry is slightly sweet and sour. It has tomato and cashewnut based gravy garnished with butter and cream. Dal Makhani- Made with Split black gram, red kidney beans, cream and butter, this dal is undoubtedly everyone's favourite. Gulab jamun- A classic Indian sweet or dessert that is very famous and is enjoyed in most festive and celebration meals. These are berry sized balls dunked in rose flavored sugar syrup. Dry Kachori- Deep fried sweetish crispy crunchy balls of refined wheat flour stuffed with spicy mixed gram flour and other spices. Tilgul- Tilgul is a colourful sesame candy with jaggery and peanuts. On Makarsankranti festival, people exchange tilgul with wishes. It is a great source of vital nutrients to our body especially in winter season.